In 2006 he and the group won the Microsoft Idea Wins Challenge for best small business idea, allowing them to fund a new program in New York City called Slam-chops. From 2007-2008 he served as the Creative Director of SlamChops, and was responsible for recruiting and training new artists, committed to creating artistically fulfilling, financially beneficial opportunities for all poets and performers in hopes of restoring “poet” as a legitimate profession among the masses. With Mayhem Poets he has performed at such notable venues as the Capitol Center for the Arts in Concord, New Hampshire; the Manitoba Theater for Young People in Winnipeg, Canada; the World Famous Apollo Theater in Harlem, and at New York’s only theater devoted to youth and family audiences; the prestigious New Victory Theater located on the New 42nd Street in Times Square. He has also performed at the Washington National Cathedral in Washington D.C, the Kilkenny Arts Festival in Kilkenny, Ireland, in Tel Aviv, Israel; Bangkok, Thailand as well as in countless elementary, middle and high-schools across the world. Visit www.mayhempoets.com for an upcoming schedule, videos and more information on the group. New Street Poets confronts the loss of urban culture to “urban renewal”. When the forces of gentrification threaten to redevelop Café Home, center of a vibrant artistic neighborhood, six dynamic poets must struggle to keep their community alive. This exciting spoken word drama confronts the human cost of progress in the 21st century. New Street Poets was written by a collective of six poets over the course of two years (known as the NEW STREET COLLECTIVE) and has been performed in several venues throughout the tri-state area, including The Tony Award Winning Crossroads Theatre, The Aetna Theatre, The Riverside Church Theatre, and Brown University. The group is currently working on a new play about education reform, individuality, and conformity! They are writing, creating, and performing in cooperation with Project Eye to Eye, a nonprofit organization dedicated to learning disability advocacy and self-empowerment. S.W.A.P. Spoken Word Almanac Project, a summary of the years news done entirely in Spoken Word, curated by Darian Dauchan, produced by Malcolm Barrett. SCONNETTTS 2013 Poetry Book of all sonnets by Scottt Raven based on his relationships over the past fifteen years. MILKSHAKESPEARE THE SERIES an obsessive poet, really good ice-cream and the bard. A new series written and conceived by Scott Raven and Heidi O’Connell. SYNESTHESIA a game of artistic telephone across the genres created by Electric Pear Productions. POETIC PEOPLE POWER: an annual show curated by Tara Bracco where poets are commissioned to write on a current relevant topic. 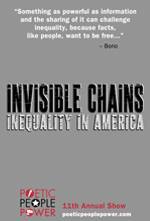 I participated in the 2013 show on the subject of INEQUALITY IN AMERICA.